LONDON (AP) Simona Halep was ready for a vacation. It’s going to start a week earlier than she wanted after she gave away a big lead, wasted a match point and lost at Wimbledon, joining the procession of top women on the way out. Ranked and seeded No. 1, fresh off her winning first Grand Slam title at the French Open, so sure she had figured out how to overcome the big-moment anxiety that was so problematic for so long, Halep chastised herself as ”unprofessional” after bowing out in the third round at the All England Club on Saturday, dropping the last five games while being beaten 3-6, 6-4, 7-5 by Hsieh Su-Wei of Taiwan. For the first time in Wimbledon history, none of the top five women’s seeds reached the round of 16. Only one of the top 10 seeds will be in action in Week 2: No. 7 Karolina Pliskova. The only past champion at the grass-court tournament left is Serena Williams. Only two other women among the 16 left even own a Grand Slam singles title: Angelique Kerber has two, Jelena Ostapenko one. Far less so in the men’s bracket, although No. 4 seed Alexander Zverev did depart Saturday with a 7-6 (2), 4-6, 7-5, 6-3, 6-0 loss to Ernests Gulbis, a Latvian ranked 138th who is the first male qualifier since 2012 to reach Wimbledon’s fourth round. In this case, though, Gulbis already has been a major semifinalist – he made it that far at the 2014 French Open, but his ranking slid because of a series of injuries – while the up-and-coming, 21-year-old Zverev has yet to have that sort of breakthrough. 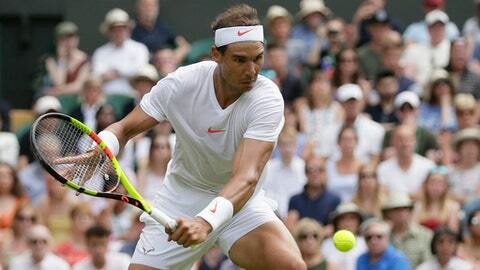 Otherwise, Rafael Nadal, Novak Djokovic and Juan Martin del Potro all won on a day the English spectators were preoccupied with two things: soccer and the sun. They followed along on cell phones as England beat Sweden 2-0 in the World Cup quarterfinals in Russia – the All England Club did not put that other sport on any of the video screens – and used umbrellas, fans and lotion to deal with heat that reached 90 degrees (32 Celsius). Halep essentially wilted after leading 5-2 in the third set. She wouldn’t win another game. Halep was a point from victory while ahead 5-4 as Hsieh served at 30-40. But the 48th-ranked Hsieh got out of that predicament with a backhand winner. Halep held two break points in the last game, but failed to convert either. Asked when she thought she could win the match, Hsieh responded, ”I don’t feel I can,” then leaned forward and laughed heartily. She did a lot of that during her news conference, making jokes and cracking herself up. She plays an unconventional brand of tennis, relying on drop shots repeatedly – which, she said, tends to drive practice partners ”crazy” – and gripping her racket with two hands for forehands and backhands. Getting to the fourth round equals her best run at a major tournament in singles, although she does own two Grand Slam doubles championships. And she apparently enjoys the spotlight, because all three of her career victories over top-10 opponents came at the Australian Open (two-time major champion Garbine Muguruza), French Open (2017 Wimbledon semifinalist Johanna Konta) and, now, Wimbledon. On Monday, Hsieh will face 2014 Australian Open runner-up Dominika Cibulkova with a spot in the quarterfinals at stake. Other round-of-16 matchups on the top half of the draw: No. 12 seed Ostapenko against 50th-ranked Aliaksandra Sasnovich, who stunned two-time Wimbledon champion Petra Kvitova in the first round; No. 14 Daria Kasatkina against 47th-ranked Alison Van Uytvanck, who beat defending champ Muguruza in the second round; and No. 11 Kerber against 56th-ranked Belinda Bencic, who defeated No 6 Caroline Garcia in the first round. The bottom half of the bracket’s matches Monday: seven-time champion Williams vs. 120th-ranked qualifier Evgeniya Rodina; 35th-ranked Ekaterina Makarova vs. 52nd-ranked Camila Giorgi; Pliskova vs. No. 20 Kiki Bertens; No. 13 Julia Goerges vs. 55th-ranked Donna Vekic, who eliminated 2017 U.S. Open champion Sloane Stephens in the first round. Halep will be gone, off for some sort of much-needed rest and relaxation. What will she do with the free time?